It’s now accepted that learning how to paint pictures is right up there with other methods of warding off depression, social isolation and the onset of dementia, although they’re not the reasons local Whitehorse resident Russell Houghton started painting again. “I always enjoyed drawing and was a keen painter in my teens, but once I embarked on my professional career in the finance sector, the long hours and associated stress dulled the creative process for me,” said Russell. “The class I’m in takes a collaborative approach to creating art in varying mediums which I find extremely stimulating as it encourages freedom of expression, although we have other classes that take the more traditional tuition approach, so there’s really something for all tastes,” said Russell. 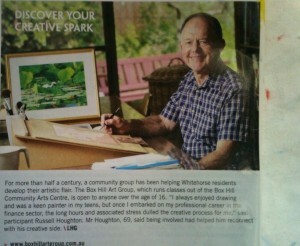 Established in 1952, the Box Hill Art Group caters for beginners as well as experienced artists with four two-hour classes each week in the Box Hill Community Arts Centre, covering all styles and media such as water colour, oils, acrylic, pastel, pencil, and charcoal. Life drawing is available and special ‘paint outs’ are also organised for painters to visit interesting locations to paint in the wild.